This debut has been a pleasure to work on from the moment a sales department colleague suggested I take a look because it really had something special, through seeing that for myself, to watching bookseller after bookseller read it and agree, to seeing it land up on every list of “most anticipated spring books,” to landing the #1 Indie Next pick for April. Now we’re three weeks from on sale and I can’t wait to see what the rest of the book reading world thinks. So what’s the big deal? Is this some weighty Franzen-like tome? Are we talking Eggers or DeLillo? The next suspense blockbuster with an alcoholic crime solver on a train? None of the above. In fact The Nest could fool you. It’s funny, stylish, dishy—occasionally hilarious—and goes down very, very easy. But don’t mistake that for froth. This social satire traces its lineage straight back to Jane Austen. While you’ll enjoy every minute with the charming, dysfunctional Plumbs, in the end this sharp-eyed social satire will leave you pondering what families mean to one another; how class, money and entitlement define and distort our sense of self; and how we do (or don’t) cope with what the world throws at us. As I mentioned this is a #1 Indie Next pick; it’s also a LibraryReads pick and arrives with great media coverage: the author will discuss her book on NBC’s Late Night with Seth Meyers the night before on sale and will also be interviewed on NPR’s All Things Considered. There will be a New York Magazine feature the week of on sale and reviews are already scheduled for the NYTBR, People, Los Angeles Times, Seattle Times and San Francisco Chronicle–with many more to come, I’m sure. “As four middle-aged Plumb siblings—Leo, Beatrice, Jack, and Melody—await the distribution of the trust fund their father had established for them as just an extra dividend in what he assumed would be their financially comfortable lives, they find themselves in dire economic straits. Unfortunately, the Nest (as they call the trust fund) had been used to settle the medical bills for a young woman who was badly injured when an inebriated Leo crashed his Porsche while they were inside it and getting intimate….Sweeney spins a fast-moving, often-humorous narrative, and her portrait of each sibling is compassionate even as she reveals their foibles with emotional clarity. She sets scenes among iconic Manhattan watering places, capturing the tempo of various neighborhoods. Her writing is assured, energetic, and adroitly plotted, sweeping the reader along through an engrossing narrative that endears readers to the Plumb family for their essential humanity. The Nest is a juicy plum(b) of a book, ripe to bursting with characters who in turn surprise, excite, and enthrall. Four siblings find themselves scrambling when their coveted inheritance is decimated after the eldest brother’s foolish accident drains the funds they’ve already committed elsewhere. Who will be crushed by the uncertainties, who will rise above them, and who will run away? …While you won’t wish to join the dysfunctional Plumb clan, you’ll be grateful to admire and judge them from afar. 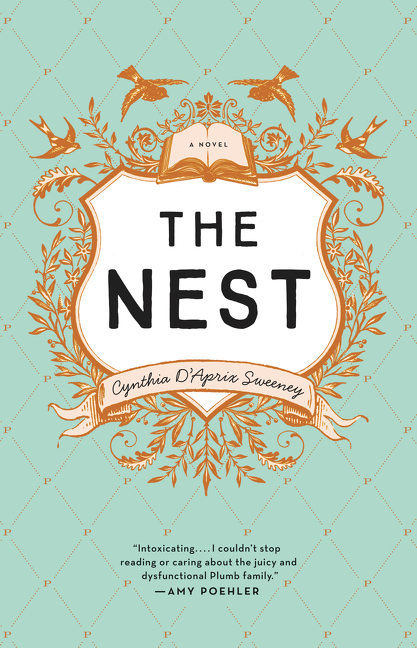 The Nest (9780062414212) by Cynthia D’Aprix Sweeney. $26.99 hardcover. 3/22/16 on sale.